After my first successful expedition to Chang Zhou ,- or "Danes Island" -, as it was formerly known, I did not expect to return again, since I already had accomplished what I came for. However,- although I finally found the old Western Cemetery, I had no idea of where exactly I found it. Driving around virtually everywhere on this island for most of a day had made me loose my sense of direction, and due to mist and air pollution the visibility was rather poor, which efficiently prevented me from spotting well known features in the surroundings. But again in 2003 I found myself in the neighborhood of "Danes Island". My intention this time was to do some research on other old China Trade- and Opium War locations of great historical value, and since my work progressed very well indeed, I decided to use the opportunity to spend some time to go back to Danes island and see what I could find this time! Since last visit I also had some information from one of my countrymen residing in Hong Kong , - Mr. Henning Hoeg Hansen -, who is writing books and has researched Chinese burial rites. He informed me, that the cemetery I had "found" might NOT even be at the original place, but was relocated and reestablish at the present location in 1980! 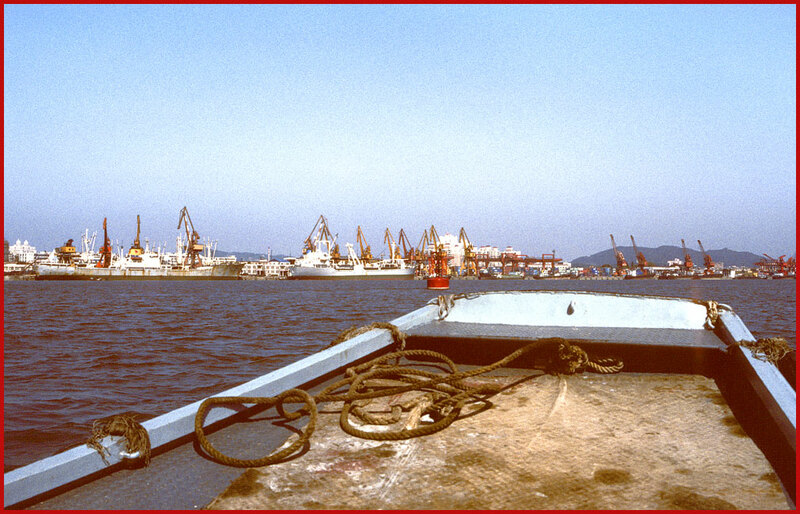 Also, - during the past 160 years, there are good reasons to believe, that the geography of the Pearl River delta and its many islands and waterways had changed. Therefore, - what we see on old paintings of the area, might NOT necessarily be the same as what we see today! Whampoa Island, - at the ferry station to Danes Island. So off I went to "Danes Island" ,- this time accompanied by Kit Yu, who was very handy to have around as interpreter! This time my approach was from the ferry station on Whampoa island just across the water from "Danes Island", - and very near the old Western Cemetery -, so this time it was no problem to find the place. 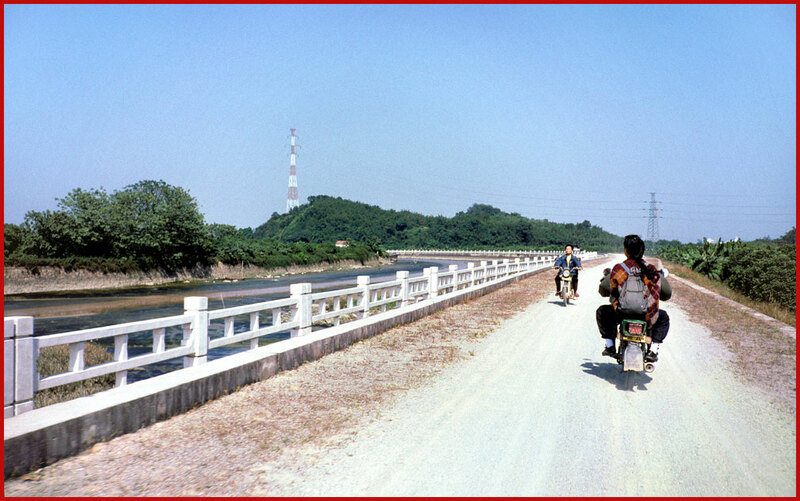 The difference between last visit was, that now it was Kit Yu, - and not Xiao Ling -, who was riding the motor bike in front of me, and this time the weather was very good, with clear, blue sky, and and an unusual good visibility! 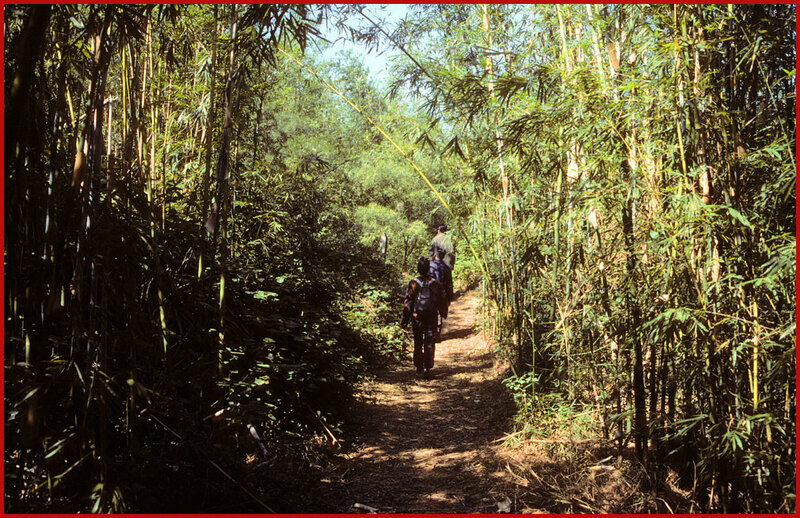 Also we got there a lot easier, and only had to walk in the bamboo groves for a short time before I recognized the surroundings from my previous visit. This is a new road following the present days canal separating Danes Island to the right from French Island to the left. 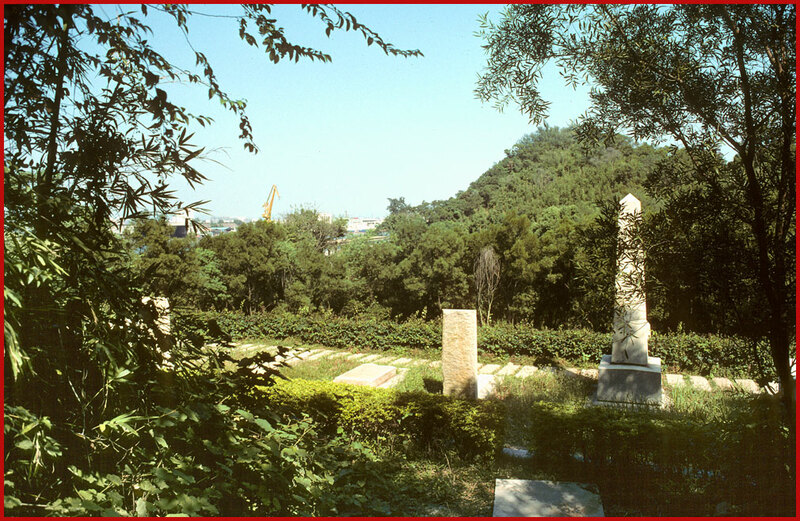 The grave site is on the mountain in the background, just below the red and white coloured mast. - and suddenly we are there! 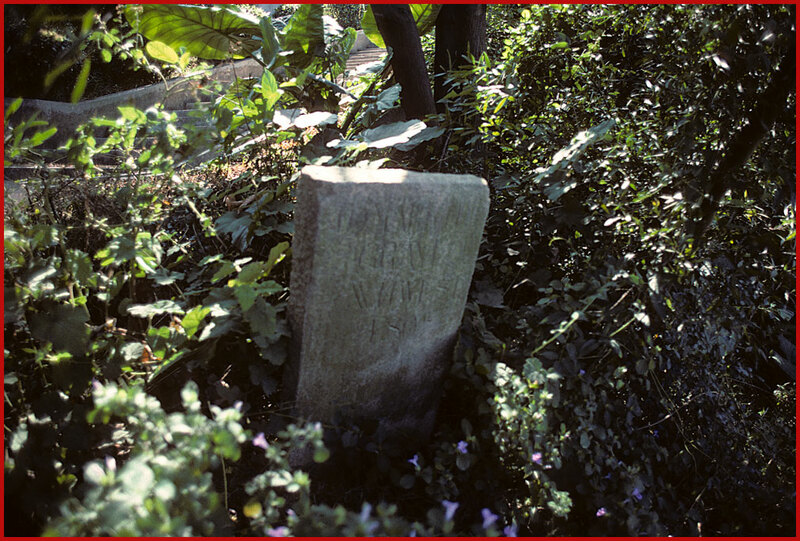 Here a Danish grave,- the one of Andreas Allewelt, - a well known trader. 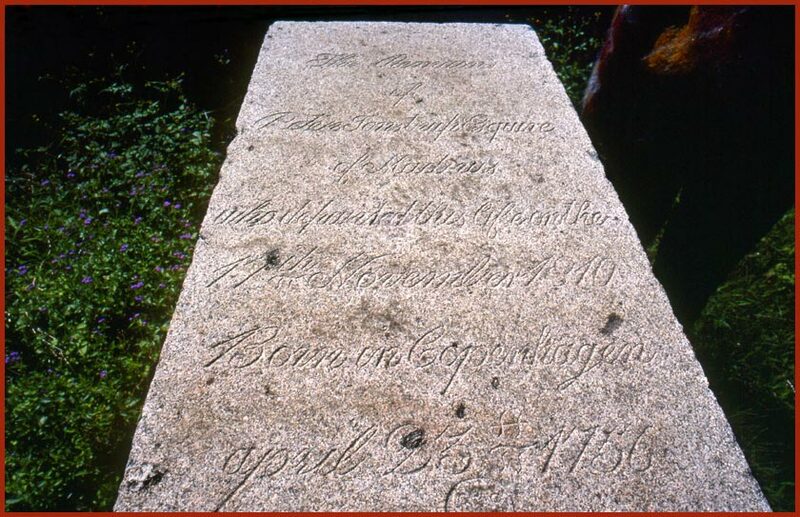 - born in Copenhagen in 1756, and buried here on the China Coast in 1810. But now came the question about the grave site itself. 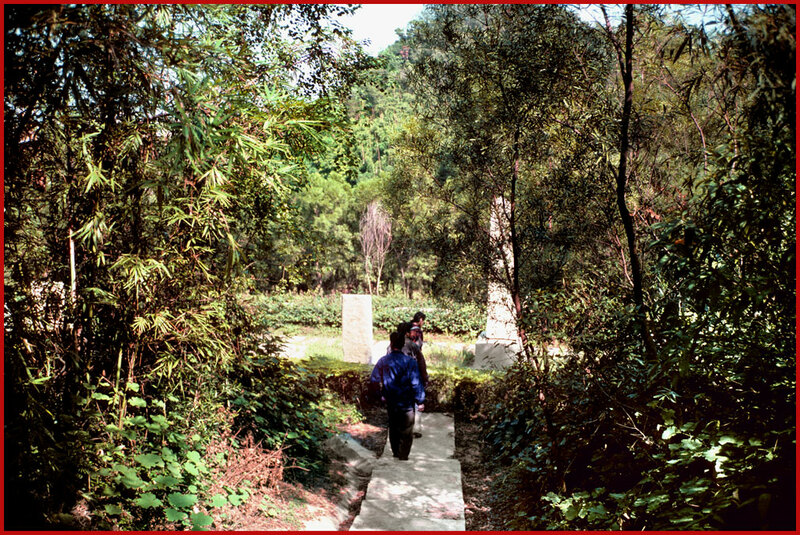 I climbed the mountain top above the grave site,- and due to the unusual good visibility, I could easily survey the landscape, the Pearl River and the islands. 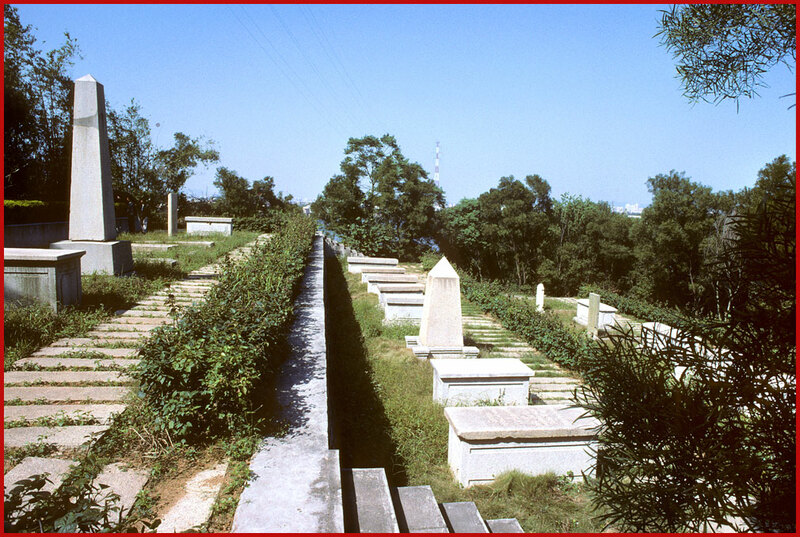 A view from the top of "Cemetery Hill" in year 2003, - surprisingly similar to the view in 1850! It did indeed look very much as the view shown on my painting. The Pazhou Pagoda,- better known as the Whampoa pagoda, and well known navigation point for the early navigators -, could be easily seen on its small hill, although it was now surrounded by buildings, and instead of being right near the water, it now appeared to be much further inland. Indeed, - the landscape had really changed during the last 160 years. 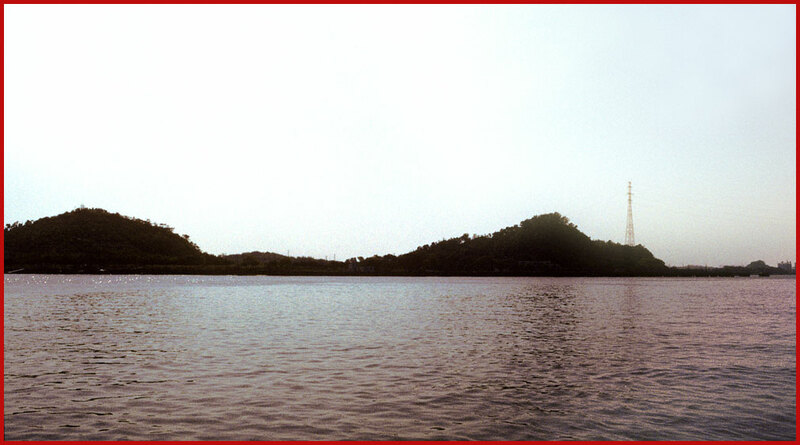 Also the slopes of "White Cloud" mountain could be seen behind the pagoda! 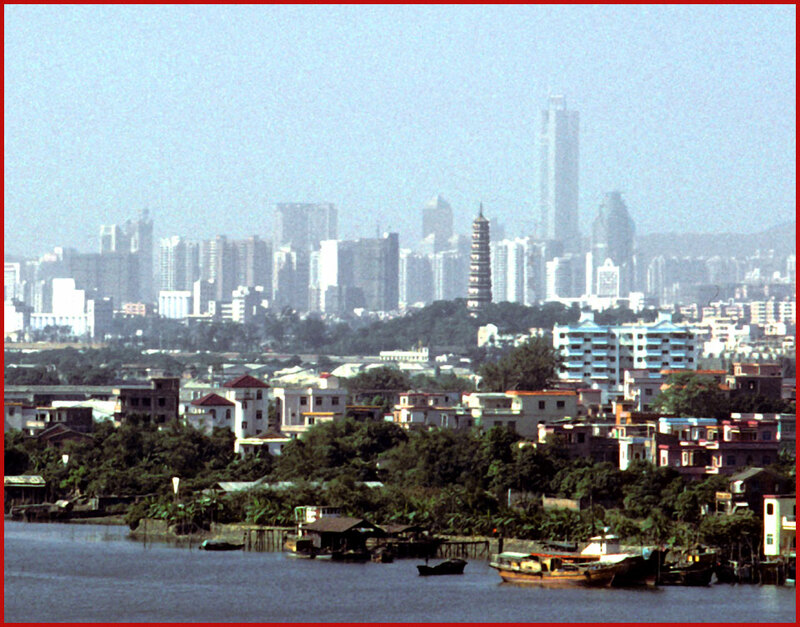 Now obscured, - not by mist -,but by Guangzhous skyline of modern high rise buildings. But again exactly as on my painting, with the top of "White Cloud" mountain to the right! Also the view into "Fidler's Reach" fitted in very well. At that time I was almost convinced that I really was on the right spot,- but one important thing did NOT fit in! My painting,- and numerous other old paintings of the same area-, was all painted from a mountain position behind and above "Cemetery Hill",- but this mountain seemed to be totally absent! Artistic freedom could explain the absence of the mountain, because the scenery is so much better if seen a little bit from above,- so it could very well be artistic freedom, that made the old artists paint the scene the way they did way back in the 1800's! Furthermore, - they usually painted every detail very accurately, so there was a "problem" here with the missing mountain behind the cemetery. However,- very near the present cemetery, - a little to the north- east -, there was a mountain that fitted in perfectly when it comes to the right view point, but then again,- other things did NOT fit in! Most disturbing was, that "Cemetery Hill" was totally missing,- and so was "French Reach", although there was water in form of a closed port area, now being used by a modern shipyard, and as landing place for the small local ferry from Whampoa Island! A crane and some buildings from the modern shipyard can be seen below the mountain. 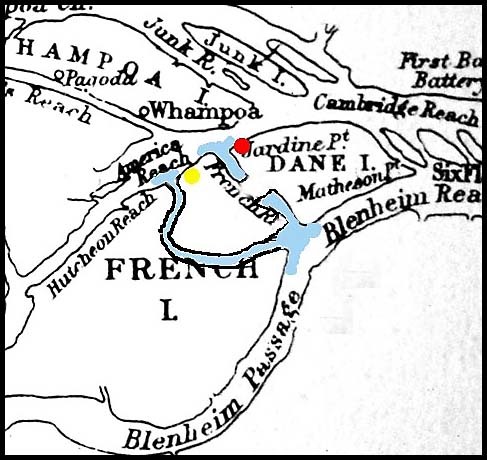 So, - "French Reach" was missing, although it could over the years have been replaced by the present harbour. The river arm,- "Fidler's Reach" -, seems to fit in much better than it did from the present "Cemetery Hill", but again,- this could easily be explained by small changes in the landscape during the last 160 years. From exactly which location did the artist actually paint the picture???? While being there,- I concluded that the cemetery was indeed on the original spot, because more things seemed to fit in,- compared to things that did not fit in! But the last checks was done after I arrived home! I simply mobilized all the maps I had of the area,- from very early maps, to maps from the 1840's and up to modern days maps of the area and Guangzhou City. When comparing the maps it really struck me how different "Danes Island" looked on the different maps from different periods of time. This ,- of course-, could partly be explained by the inadequate survey methods of that time,- but as Henning Hoeg Hansen of Hong Kong had suggested to me,- it certainly could be because the present landscape has changed a lot during the last 160 years! But before I checked that out,- I tried to draw lines in my modern map, based on bearings from different positions. The only points that had NOT changed during the time, was the position of the Whampoa Pagoda and the "White Cloud" mountain. Lines drawn through those fix points revealed, that actually BOTH possible position of the cemetery could be correct. Only I had some doubt, that the mountain slope I could see on my photos , might NOT be "White Cloud" mountain,- but maybe another one? Also I could not see the top of the mountain. Therefore I also used a new fix point,- the position of the very tall building which you can see a little to the right on the photographs showing the view from "Cemetery Hill". Of course this building was not there for 160 years ago,- but it is excellent for taking bearings from "Danes Island", since its position is clearly marked in the modern Guangzhou city map! But the method of taking bearings and comparing my new photos with old paintings still had not answered my question, since both possible positions could be correct, because they simply were positioned so close to each other! But which one was actually the right one???? Now I used my computer, and scanned pictures of several old- as well as new maps-, and could compare directly in the same scale! The geography of "Danes Island" really had changed dramatically over the years! Here is "Danes Island" as it looks on the latest chart over the area. Now have a look at an old English chart from the 1840's, - which corresponds very much to other maps from the same period. Danes Island (Chang Zhou) - 1840's. 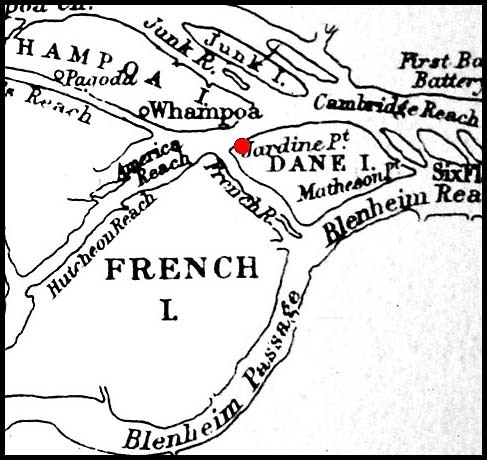 Here is "Danes Island" and "French Island" clearly shown,- and it is easy to see the big difference from the modern map. I have marked the position of the original grave site at "Jardine Point" with a red dot! But now try to "correct" the old map from 1840 so that it matches the new chart,- and see what you get! Here the "corrected" map,- a combination of map making of 1840 and year 2003. "French Reach" is now partly filled in,- forming the port used by the shipyard and as ferry station for the Whampoa ferry. A new "French Reach" has appeared a little further south! 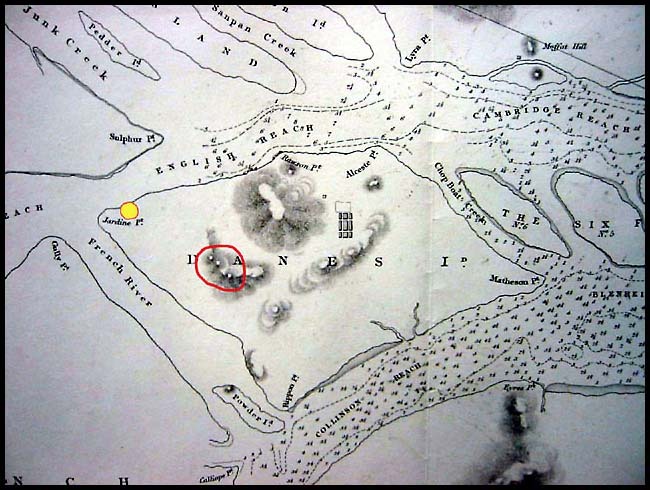 Again the yellow dot marks the present position of the cemetery,- and you will see, that although it is actually positioned on "Danes Island",- on a piece of "reclaimed" land - , then the modified map clearly suggests, that this position was earlier a part of "French Island"!!! Confused anyone???? 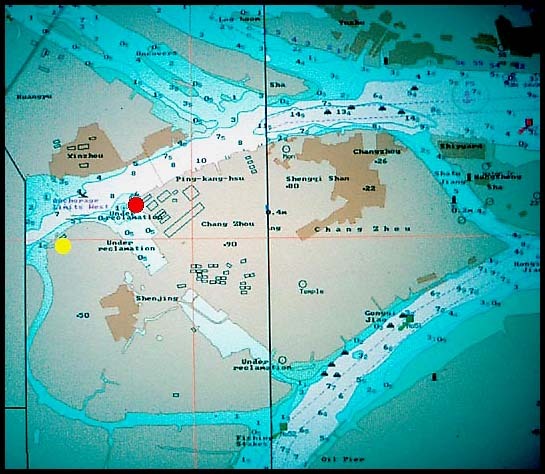 Well,- the scenery as shown on my painting, MUST have been the view from the present hilltop just behind the ship yard and the red dot shown on the above maps! But many years after the painting was painted in 1850, - the small hilltop with the tombs has completely disappeared! 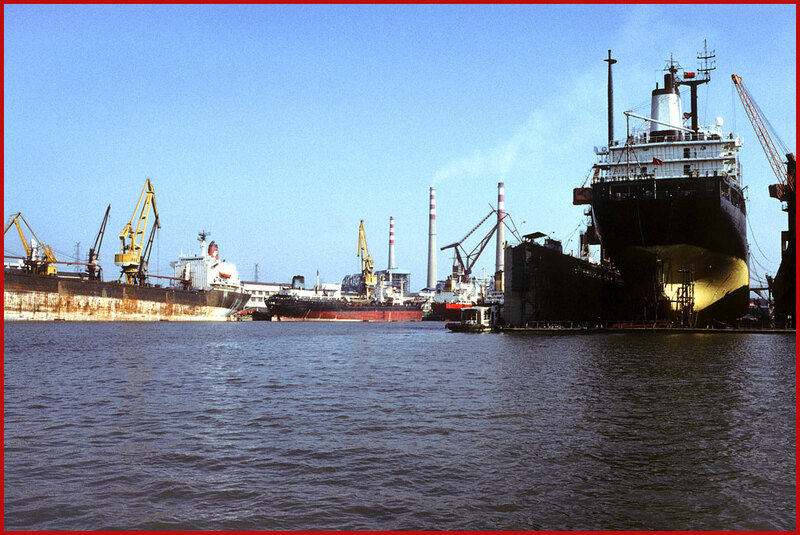 The hill has been leveled, and a modern shipyard has been built on the site! 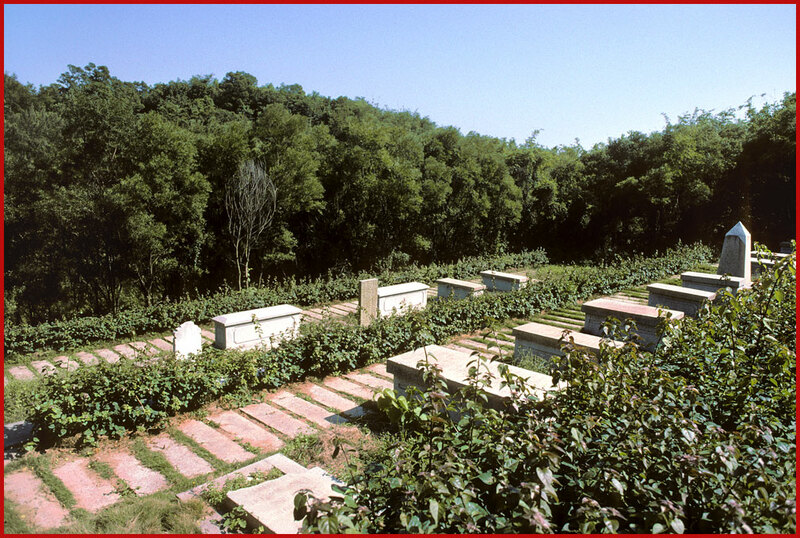 Since nothing was left from the original cemetery, the Chinese authorities have rounded up as many of the old original tombstones as they could find, and reestablished the cemetery on its present position in 1980. 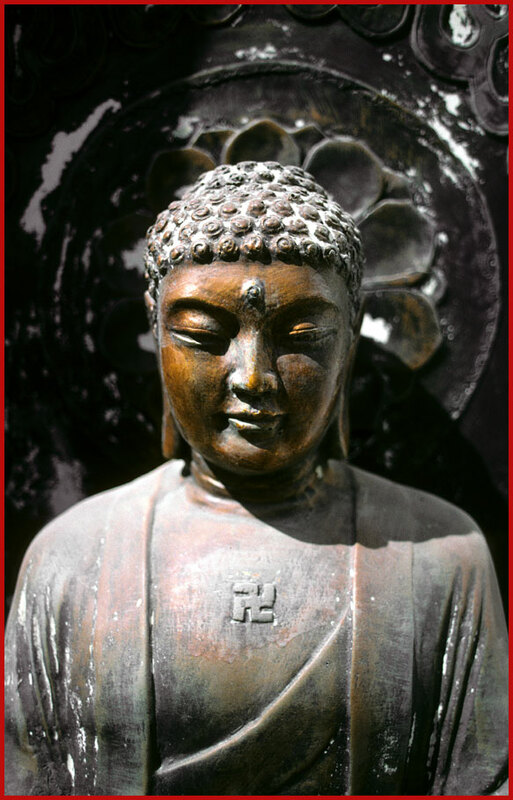 However,- I still believe, that the "new" site is actually not new,- but another grave site from the heyday of the China trade. I base that conclusion on the fact, that NOT all graves in the area are restored! In fact there are several very old looking stones to be found just outside the rim of restored graves. 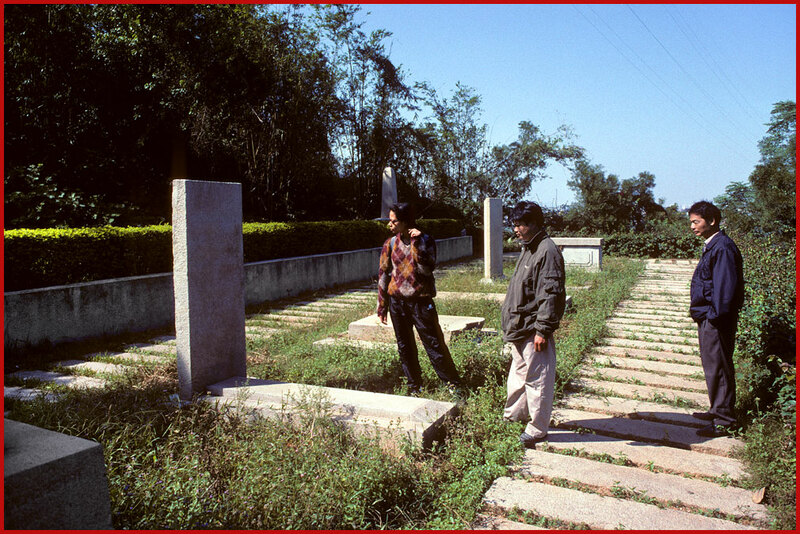 Those tomb stones are not standing nice and vertical, in straight lines, but slantwise scattered around at random, and partly overgrown by the vegetation. Based on above, I therefore believe, that originally there must have been TWO separate grave sites,- one on "Danes Island" and one on "French Island". Now the original site on "Danes Island" has completely disappeared,- and the remains have been transferred and reestablished at the original site of a similar cemetery on "French Island",- which has now become a part of "Danes Island"! Whatever the truth is behind this story, then I have now obtained complete peace in my mind! Here once again is the terrific view that started it all, - and please try to compare the view with the following photograph, - which was also shown earlier on this page! Finally another old map showing my final (?????) conclusion! I am quite sure, that the artist who painted the picture, MUST have been sitting somewhere on the small mountain marked with a red ring around it! And the "Cemetery Hill" he painted, - marked with yellow-, MUST have been in front of this mountain at Jardine Point! The artists viewpoint, - marked with a red circle -, when he painted the original picture! 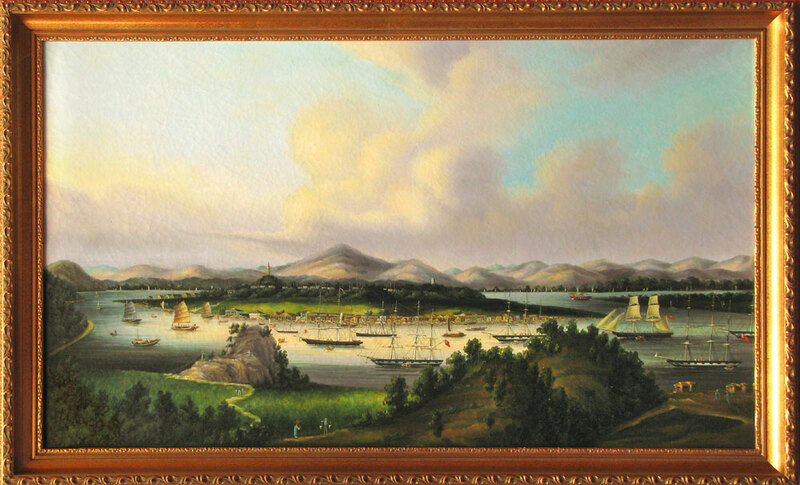 The yellow dot at Jardine Point is the position of the original cemetery as seen on the painting. 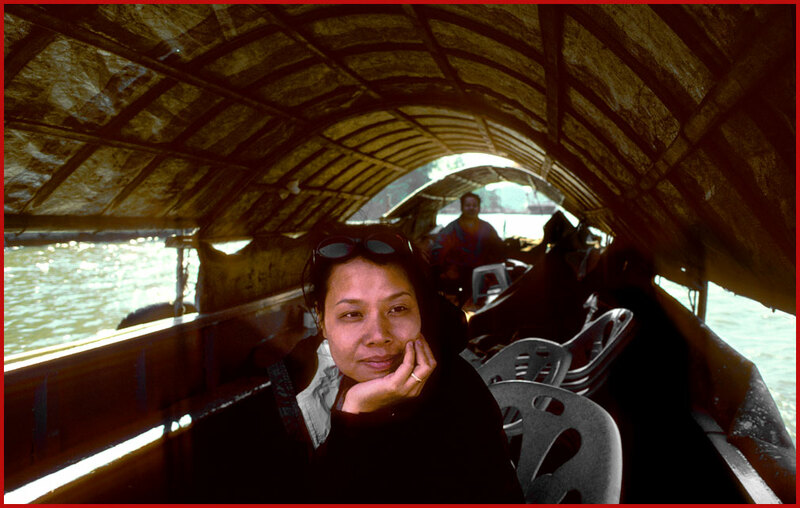 Over the years I have been navigating the Pearl River in almost any imaginable type of boat, like ferry from Hong Kong, fast outboard powered small open boats, - local ferries between the Pearl River islands, - local ferries from mainland to Pearl River islands, - local water taxies and , - of course -, big modern merchant ships. But regardless of how I navigate this river, - and what type of craft I use -, the sense of history is immense. 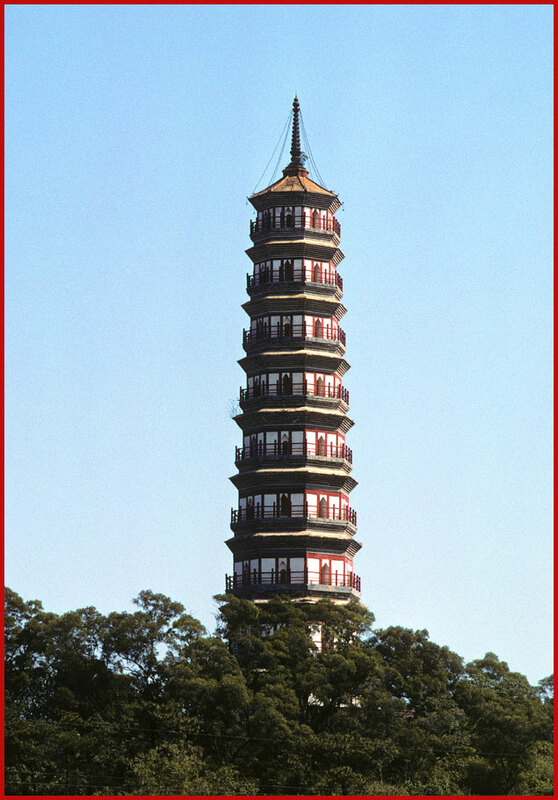 The three famous pagodas, Linhua, Pazhou and Chigang were actually referred to as "the three masts of Guangzhou", because the sailors used them as important navigation points. 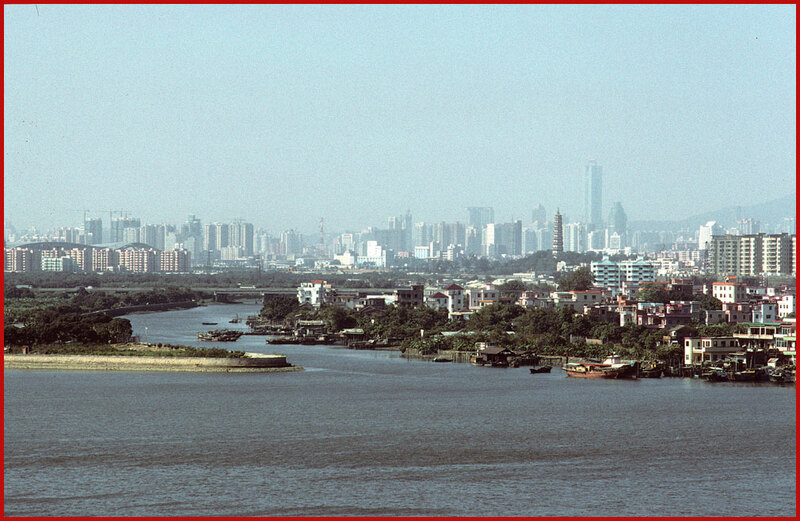 The real name of the Whampoa Pagoda is actually Pazhou, named after the village of the same name. 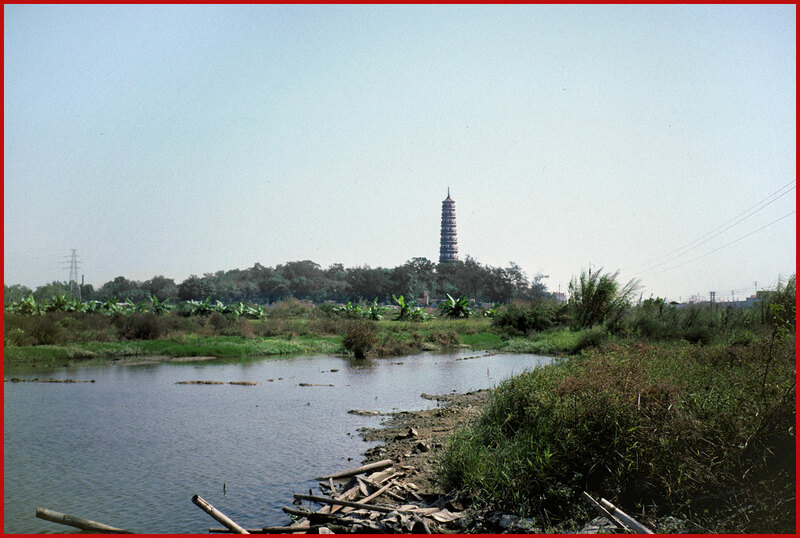 It is also referred to as Haiao pagoda, - the Turtle Tower -, because the legend says that a giant turtle was often observed in this area of the Pearl River. 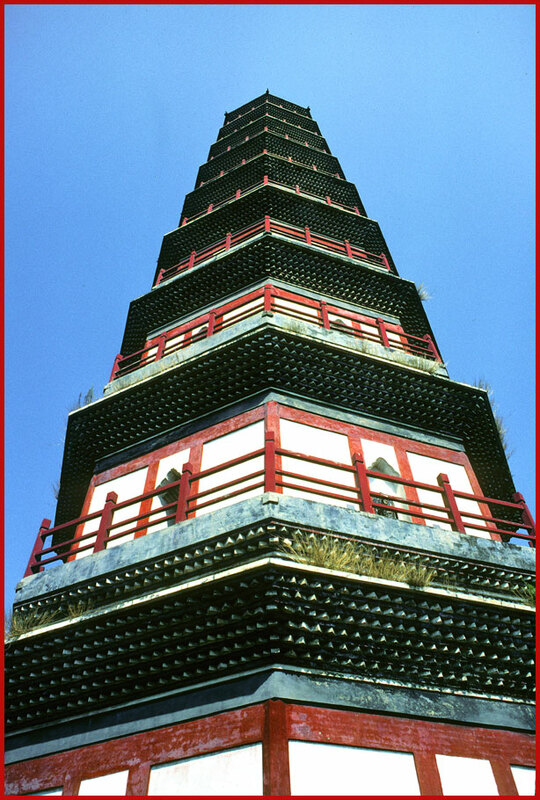 Construction of this almost 50 meter high pagoda began in 1597, and it was completed in year 1600. 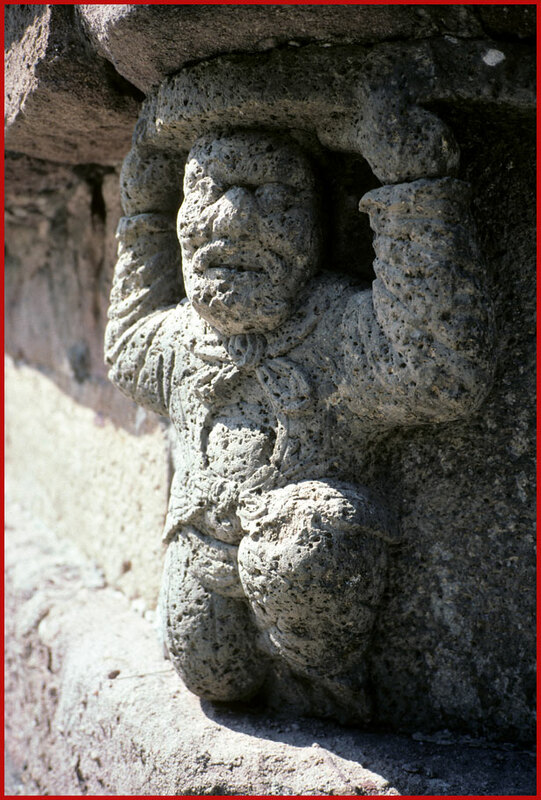 The base has some wonderful statues of giants that apparently carry the pagoda. With mission accomplished, it was once more time to leave Danes Island, with it's history and ghosts from the past. 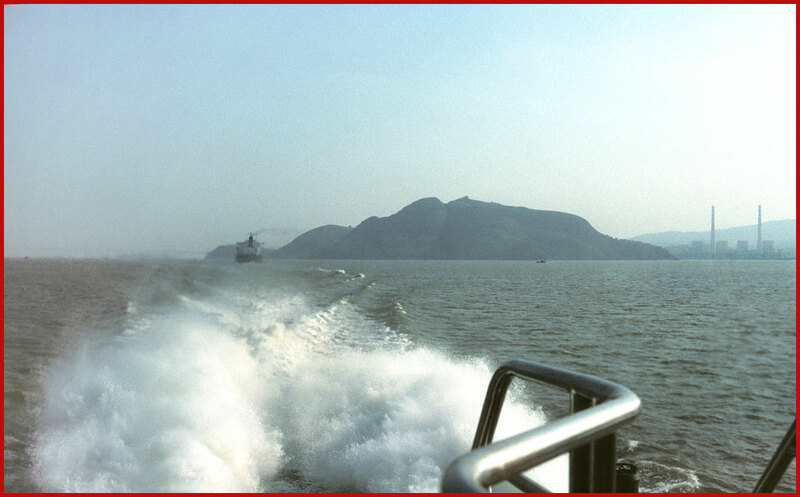 Kit Yu and I Leaving the island by a local water taxi, - destination Whampoa. At Whampoa I had to check out some more interesting historical stuff, - this time Chinese history. Danes Island??? Did Denmark posses a colony in China??? No! 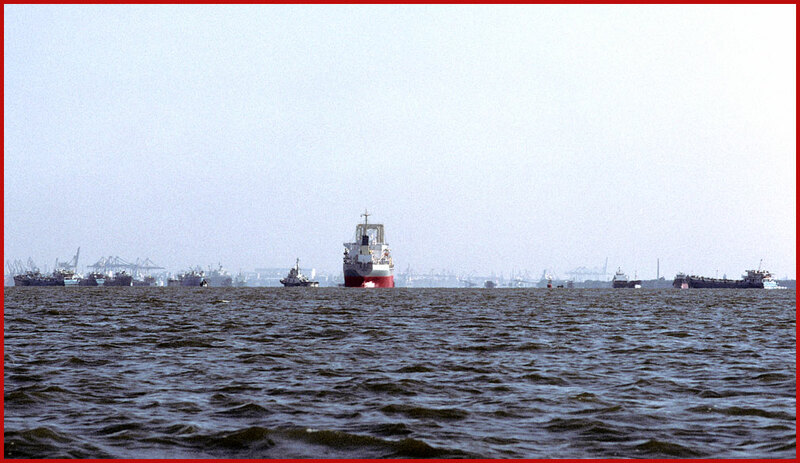 The name Danes Island came from the fact, that the coast of this particular island was mainly used as anchorage for the Danish ships, - hence the name Danes Island. The same goes for French Island! This is where the French ships dropped their anchor! 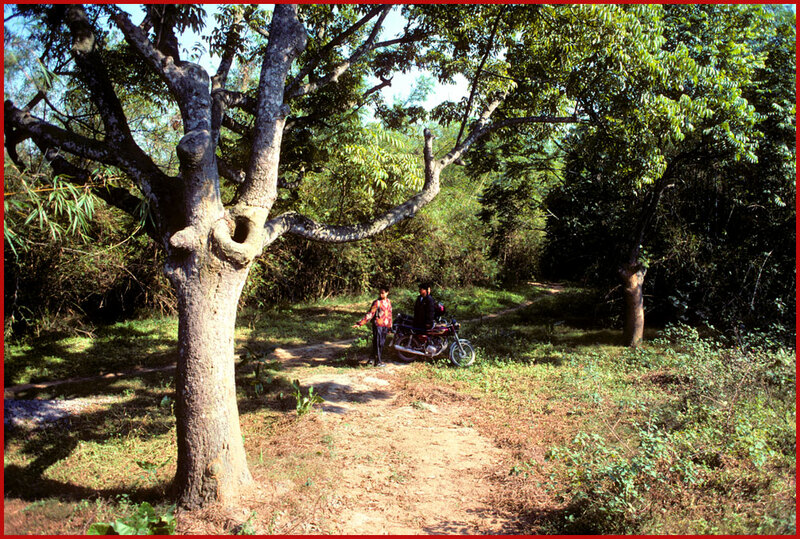 What did all those Western ships do there at this place, - in the middle of nothing -, far from the big city Canton??? 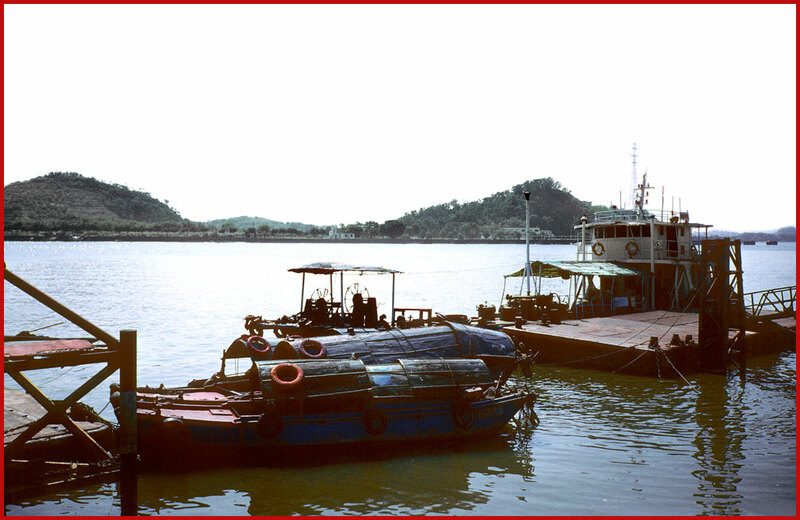 They discharged and loaded cargo into smaller cargo junks, which then brought the cargo to and from Shamian Island at Canton, where the actual trade took place. This is because the western ships were forbidden go further up the river. What was Danes Island? - and what does it look like today?? - are fully answered in these web pages.